The opening day of London Fashion Week saw Somerset House alive with activity from dawn 'till dusk. 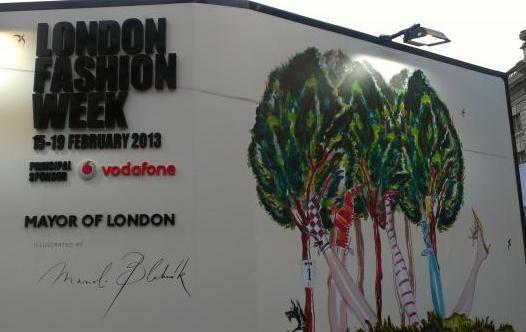 LFW was officially launched by Samantha Cameron and Nathalie Massenet (Founder and Chairman of Net-a-Porter) at No. 10 Downing Street. Samantha told the audience that included Salma Hayek and Helena Christensen. "The British Fashion Industry is a huge source of pride to this country". One such home-grown talent, Christopher Bailey currently working wonders at Burberry was a key face in the current British Fashion scene talking to guests at the reception this evening. Many other international fashion figures such as Manolo Blahnik and Donatella Versace also came to celebrate British Design success. Stephen Jones the British Miliner who has won great aclaim in the last few years opened the way for more Young British Designers to gain recognition by Holding a Tea Party in the Ground Floor showrooms to showcase their talents. The room showcases the work of several designers Piers Atkinson, Aurora Ozma and William Chambers, all under the Headonism banner. Headonism is a Key initiative of the British Fashion Council that is sponsored by Royal Ascot. There is a lot of interesting play with high millinery here. There are even a couple of very intricate veils in two of the collections. I find this interesting as it's a fsahion that has left western culture where it was once, in ancient times a daily part of women's dress. With the exception of Bridal Wear, Veils disappeared at the end of the Edwardian era for most women and then where associated with deep Mourning. One famous lady in Fashion Diane Pernet does however wear the veil beautifully in full Black lacy glory with the Panache of a Sicilian Grande Dame. Jean-Pierre Braganza's collection draws on the primal power of the femail form. "I'm obsessed with the idea that numbers and geometry have symbolic and cosmic value, with the female form being the ultimate cosmic being." To a girl like myself drawn to both Fashion and beautiful mathematics and form this is music to my ears. In JPB's world Women are the leaders of a tribe. Their clothes are inspired by Sci-Fi and fantasy combining Samurai Silhouettes and dramatic length to convey power, wisdom and elegance. He mixes utilitarian colour-block paneling and hyper-real prints to create an absolute balance of beauty. He makes a contrast between dark nighttime colours and pure White and rich Peach, giving a light softness. The intricate scales of the Dragon are used with circles to create many geometric shapes and symbles. This unique print is also incorporated into luxurious silk jacquard, in Midnight Blue with Black and Silver weaves. He works with the lightest of Silk Chiffon and Satin and also Velvet Boucle and laser-engraved White leather. There is a wide variety of tailoring on offer in this collection. From Shirt-Dresses (so fun and a bit naughty), to jump-suits and traditional shirts. My day began up in Bloomsbury Square to see the Clements Ribeiro show. Funily enough the first few pieces from the collection that I saw where print dresses with florals and square geometric shapes. How fitting! Prom/afternoon Tea style dresses featured with knitted Cardigans and more florals. Altogether this struck me as quite a flexible collection that would appeal to people looking at it with quite different individual tastes. You can't say this about all collections that you see as they are often running on a theme of sorts even if it's a loose one. I spent some time looking carefully through the host of designers who are exhibiting at Somerset House. One name that jumped out at me was Huisan Zhang this young man born in Qindao and educated at Central St Martin's is going to do very big things in fashion I believe. His work is instantly eye catching in it's sence and use of cut and proportion. He spent a formative year in Paris working at Dior. 6 months of this was in the Haute Couture Aetelier. It shows in the tailoring of his pieces let me tell you. You can see it's his style but there is a refinement and maturity in his work that sets him apart from many. Another designer being exhibited who falls into the same category as a future star is 1205. Paula Gerbase's contemporary tailoring line shows skill that she honed in 5 years working in Saville Row for the renown Men's Tailors Hardy Aimes. The cut and the quality of her work is outstanding and strikes the eye from a distance. I'm a fan. Showing alongside 1205 is Palmer - Harding another strong duo showing that classic traditional tailoring is making strong impact on the current Ready to Wear scene. Natasha from Beulah kindly introduced me to some more of the fashion company's ethos and amazing elegant line. Until visiting the concession on Day 2 I believed they simply made accessories and had no idea of the very positive message that the company is promoting by employing women who are the victims of exploitation to make the garments and channeling part of the profits made back into helping more women like them in India. It's an extraordinary project and one that will hopefully grow in the years to come. Zoe Jordan opened London Fashion week on Friday and on Saturday I got the chance to talk to some of her team and look at the collection close up. I have to say I thought it was wonderful. It's luxury fashion. Sensible and grown up with very strong tailoring. Very saleable and very wearable. I seriously think they will be inundated with interest from Buyers from all over the world this week and the press cuttings folder is filling up fast. Zoe Jordan is a very, very promising and interesting YBD. 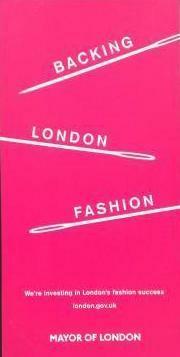 Sophia Webster and Christopher Reaburn are another 2 young British Designers who'se salon shows are hotly anticipated. I spoke with Christopher about his designs and amusingly one of the products in his range. Alongside his collection there is a popular accessory bunny rabbit bag that you can buy in Harvey Niks. It has a shoulder strap and a cute winsome look. A perfect pre-Easter treat. Christopher's salon show was very well received and I'm sure this year is going to see his fortunes rise. Sophia Webster's line of clothes and accessories is high impact young fresh pop-fashion. She is much inspired by the colour and energy of south America and is stocked in Paris and in the United States. Ahead of her show on Day 4 her stand has also drawn a lot of attention from the fashion crowds with it's own unique taste and colour. There is a very popular clutch bag in multi-coloured knit that many people think is actually a print based on 100's of smarties! a much talked about piece. John is a designer I've watched for a number of years at LFW and it's really interesting to see his work change. He's really interested in exploring colour now and this collection took it's inspiration from County Wicklow. The deep Emerald/Grass Green and Salmon Pink that gives us a hint of the Beauty of the Irish Country side where woven in to the show in numerous different ways time and time again. I loved the first dress that came out. Rose shaped flowers in deep sea-dark Green covering a shoulder less dress running to knee length. Salmon Pink Ladies Suits with beautiful Gothic Black hats provided a sharp flattering colour contrast. The Crochet detail work is still there in many pieces with a re-invigorated twist in the manner of the cut. Again as the show continued is was again struck by the beauty of the Salmon Pink and Black together. Through the series of one piece and two-piece outfits I noticed that John was not only playing with more colour than before, but I was also interested in his use of texture in the designs by applying a lot of very intricate technique. To my eyes he's reaching further than before and creating more daringly complex pieces. Cara Delevingne opened the Issa catwalk shows in a wonderful patterned dress with a beautiful plumed hat that she kept under control. The collection flowed around the tried and tested theme of prints with a South American look. Long flowing lines and romanticism where key notes of the collection. Metallics mixed with earthy colours of Ochre, Mustard and Deep Olive Green. I could also see an Amer-indian influence in the collection. Issa's shows always attract a die-hard group of followers from Brazil who make a very glamorous journey to come to the show. They are worth seeing as much as the collections themselves. I said Hello to Jasper Conran as he wound his way through the exhibition after the drama and great success of his own catwalk show a little while earlier. Another mention for this day was the young Brand Sister Sibling. They are picking up a lot of Press headings on both sides of the Atlantic and some of their knitwear is on display in the exhibition space. This knitwear label have a huge diversity of pieces. From Scalfs to knitted suits, twin sets and dresses there is a lot to chose from and you can see that there 3 talented individuals behind the one label. It all gels together to make one great performance. The team are wishing hard for a shop of their own this year and I very much hope that they get it. This is high knitwear stylish and luxuriant British fashion at it's best. Mulberry produced a wonderfully strong collection that looked very fresh. Emma Hill is unveiling more new bags and must-have's of the future. I was very taken with the first look that came out of the Brown leather suit and new-style bag. Deep rich colours where very much in evidence. Mulberry-Red made an appearance in several places. Fur trim collars where very much in evidence and alongside Tweed and woolen knit pieces are multi-material outfits. Fur or Knit tailored together with Leather to create texture and beauty and a lot of warmth in many pieces. Mulberry's Autumn-Winter 2013-14 girl will be very well wrapped. Butterfly's where everywhere as one of the signature themes for the show. Skirts falling over trousers to give that extra layered feel. Lots of fun girlish energy in this show. Anna Wintour and Jonathan Newhouse with his wife where among the front row. Peplum pleated skater skirts made a showing over trousers on many models and I think it's interesting to see this look again. Velvet and fur trim gives the show a Russian Edge and I noticed some of the velvet patterning on the Willow handbags also gave the impression, perhaps more to the point the echo of the Late 19th Century in Russia. However this was a very British show with Rule Britania playing in the closing moments to underpin's the labels identity as an iconic Heritage Brand. Mulberry is looking to extend it's global reach and I'm sure Emma and her team have created a lot of desirability with their hard work in this collection. I thought this show was fantastic and found a lot to like in this collection that would make it onto my wish list. This is the sophisticated work of the traditional Aetelier and the classic cut pieces will appeal to a very large discerning client base across all ages. Again the theme of checked/tartan material reappeared in this collection. This was high British luxury coming at you in cool crip elegance. Simple fluid lines belied the complexity of the detailed craftsmanship that had gone into many of the pieces. The embroidery work on many of the dresses was really worthy of many moments of wistful watching and I dreamed of running my hands over the garments to feel the textures. My favorite piece from this show was the long Scarlet Red coat. Again it would seem simple in construction to the casual eye but like all of this collection it bears the hall mark of the master Aetelier. This was a very interesting collection and I loved 2 things in particular. The use of knitwear - This is coming into many designer's collections and the Rose emerging in some of the design's of the collection. I particularly liked look 16 which showed a Gypsy-esque Rose printed Skirt with framed Borders matched with a Mustard Beige high neck sweater. The Rose reveals itself in many of the pieces and I also like the use of Magenta and a softer Pink in contrast that I've seen coming up as a trend in a couple of collections. I occasionally see Matthew and his little dog out for a walk. I wonder if she has a degree of input into the collections. But on a serious note there was a lot of new life in this show. This collection featured bold themes. Union Jack patterning featured prominently with lots of bright Reds, Navy - Blues and Lime Green. Strong lines where evident in high waisted jackets and at knee length skirts and dresses. Ribbing detail and fishbone stitching added a greater detail to the pieces. The print and patterning that he uses is very interesting and like several other designers I've come across this is another great unique way of getting your stamp onto your collection. Establishing a brand identity. Sophia Webster is a very exciting YBD. She's working hard and aiming high as she certainly should. Her latest collection for Autumn -Winter 2013 is alive with colours that catch the eye. Bold contrasting colours are the order of the day. I'm going to bring you a link to her website and talk more about what she's doing in depth later in the month. This is a young man many people have their eyes on as mentioned above. He has flawless lady chic already down to a fine art with a rarefied eye. The collection for Autumn-Winter '13 showed geometric lines, corners and cut away shoulders. Tailored jackets and Black embroidery overlay of a Coat dress particularly caught my eye. The repetition and re-working of the geometric simple cross design through the collection was a noted point giving structure to the collection. These pieces also had a strong 1960's connection as emphasised by the stark geometry. I saw an interesting Lemon lace shift dress, and again was sruck by the Black cross geometry design with a Black satin skirt and lace cut away top. An extremely interesting collection - one of my favourites. I was in love with so many pieces I don't know where to start. There is Black Boucle Crochet, feathers, and plenty of very high tailoring to open the collection and then it moves on into colour. Pink and Black (my favourite combinations), Red Cheques and Black lace. There is a theme of using 2 colours in a outfit. Another great combination was Black and Deep Berry or mixing White with a colour. Feathers come in for plentiful adaptation to the outfits. I particularly liked at Pink and White piece with a feathered base. A Pink full skirted dress combining with a Black lace overlay was a piece that I would wear and I think would work well on many women. As would much of this collection. It's a very mature sophisticated parcel from Erdem. I loved the floor length dresses that appeared towards the close of the collection. The base was almost fishnet in appearance but wholly suitable for Black tie evening events. Cara Delevigne the Model of the moment in New York and London opened Burberry's show in a swimsuit and sheer skirt. Sheer skirts where a theme of the collection and it's a very versatile piece. Another key look was the printed skirt and the Beige Sweater. Very wearable and flexible in the ranks of the Burberry staple pieces loved in wardrobe's across the world. More animal prints came down the catwalk sticking with the frisky playful theme of many season's gone by. The versatility of the House Trench was on display as always to the delight of the eager crowd. Coats where also heavier and warmer as if responding to the heavier winters we've seen in the past couple of years. As the Winter grips reaches for Burberry's Girl and Boy they have a wide variety of exciting clutches for him and her to take hold of. I very much liked the Black evening trench. Red and Blue featured prominently as colours in the collection, as did the working of horizontal lines into the collection. As is a feature of the Burberry collections of late the are many strong evening dresses in Black and also running through the colour theme. Paula Gerbase trained in Saville Row for 5 years before setting up her own label. Her experience in tailoring shows and her work, exhibited at Somerset House throughout London Fashion Week was one that drew many people towards her work and knowing more. Giles' specialty pieces where on display in this collection. Many fun grabbable items such as the over-sized big knitted Hats. The Gothic romantic theme comes through again from previous collections and Gold Lame lends it's touch to giving an edge to a few outfits. Gold stripes and feathers make a statement as ways to set off some pieces. I really liked the White tailored shirts that featured in the collection. I guess following on from Pauls Gerbase at 1205 my eye is tuning into these details. Patterning again gives Giles his unique designers stamp. Pink bubbles, marble effect. A Blush Pink all in One (The Onesie). My top pick from the early part of the collection would be the Cerise top and pants and the big Pink knitted hat. The collection closed in statement evening dress patterened and printed in high coloured mix. Also some great Magenta hats. I really liked a Magenta and Baby Pink coat and a wonderful Magenta bodice cut dress with Black lace trim, Black sleeves and decolette. Matching with a Black hat. I was very taken with a Magenta and Black Chinese style dress. Here there are echos of Chanel and her Uniform style. Like Husain Zhang coming close to the mastery of Dior in the influences in his work so Giles sometimes leans towards Chanel. Some canny Blush of Rose readers may tell me that he has had a relationship with the House that I'm un-aware of. It would be interesting if that was the case.